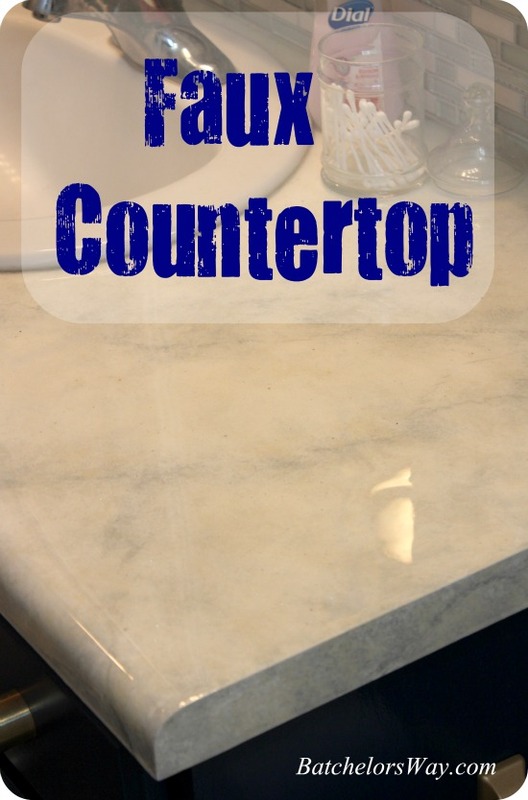 Ready for part two of the faux counters!! You can check out my counter below. It is is all painted and ready to go. You could paint it to look like any marble you choose. Mine looks good in photo's but I think it looks flat in real life. But this step will change that!! 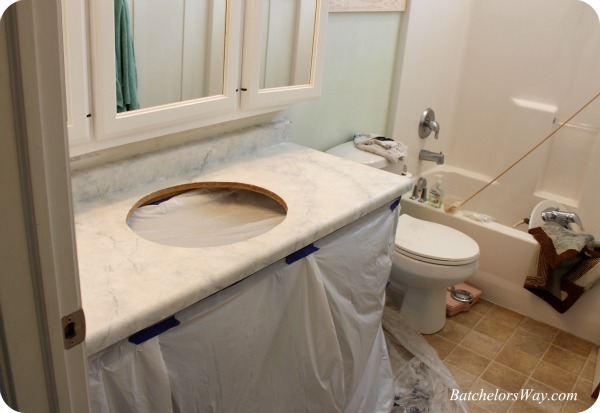 Start by covering the surrounding area with drop cloths. This glaze will make a mess on things, so you want to take special care to cover everything. 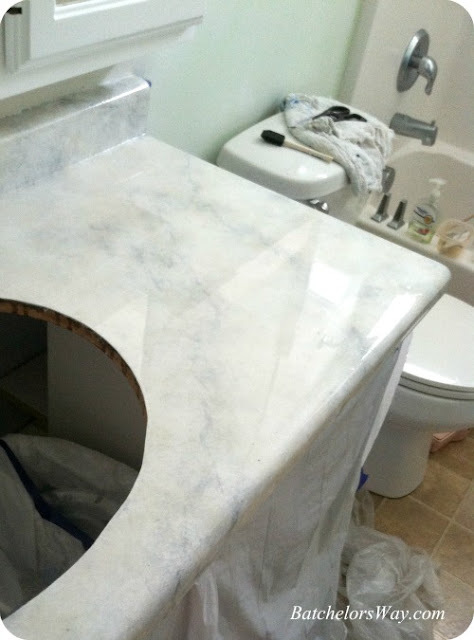 Your drop cloths will be covered in hard resin when your done and will have to be thrown away. Once your counter is prepped, take a deep breath and go for it. I want to talk to you a little bit about the glaze. I used Parks Super Glaze in the laundry room, but found a slightly cheaper brand at Lowe's this time. It was called Famowood Glazecoat. I thought I might use this instead, because glazes are glazes right? I was a little concerned that this might yellow. I found this video on YouTube comparing 12 different brands of epoxy resins. I highly recommend viewing it. It is a little long but I thought worth it. Here is the list of brands that were compared. 1. Famowood Glazecoat - Mostly available at Lowe's hardware stores. 2. Aristocrat Liquid Glass - Amazon.com (ships from Life and Home). 3. Easy Cast - Sold in most craft stores such as Michael's and Hobby Lobby. Also available online. 4. Mastercast 1-2-1 ResinArtSupply.com or Etsy.com/shop/ResinArtSupply (Use discount code 10THANKYOU2015 on Etsy for 10% off). 6. Envirotex Lite - Sold at most craft stores including Michael's & Hobby Lobby and also available online. 7, Clearcast 7000 & 7050 - Available on EBay by seller "duffitammi". 9. Parks Super Glaze - Home Depot. 10. Amazing Clear Cast - Sold at most craft stores like Hobby Lobby and Michael's, also available online. 11. Little Windows - online at www.Little-Windows.com (use discount code "ILOVERESIN" for 20% off). 12. Super Sap CCR - entropyresins.com. I'm impatient and could purchase Famowood and Parks at Lowes or Home Depot, so those are the two I was interested in. Parks came in third best and Famowood wasn't even in the top five. That made my decision easy. Parks Super Glaze round 2! Start by carefully reading your instructions multiple times. 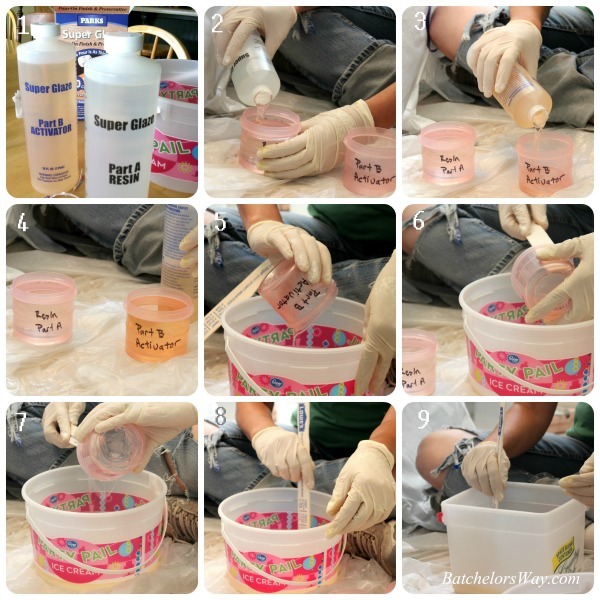 My research has shown that following the instructions for your epoxy is critical. Here is my shortened version. All your supplies will have to be thrown away afterwards. 2. Measure out Part A Resin. 3. Measure out equal amounts of Part B Activator. 4. Make sure they are equal amounts. I used about half of each jar for this coat, but if you use the whole bottle still measure to make sure they are equal amounts. 5. Pour Part A into a bucket. 6. Gently scrape the sides of measuring cup to get all the resin out. 7. Pour Part B into the bucket with Part A, carefully scraping the sides of the cup again. 8. Stir for the noted amount of time per instructions. Go slow trying not to create bubbles. 9. Pour the mixture into another bucket and stir per instructions again. It is nice to have a helper to watch the time for you! Now you are ready to pour it on to your surface. You need to have some sort of plastic spreader and a foam paint brush handy. 1. Pour a small amount on to the counter surface. 2. Gently spread the glaze letting it flow where you direct it. 3. It will self level somewhat, just help move it around. 4. Pour more and let it flow into the already spread area. Keep repeating this process until the whole area is covered. 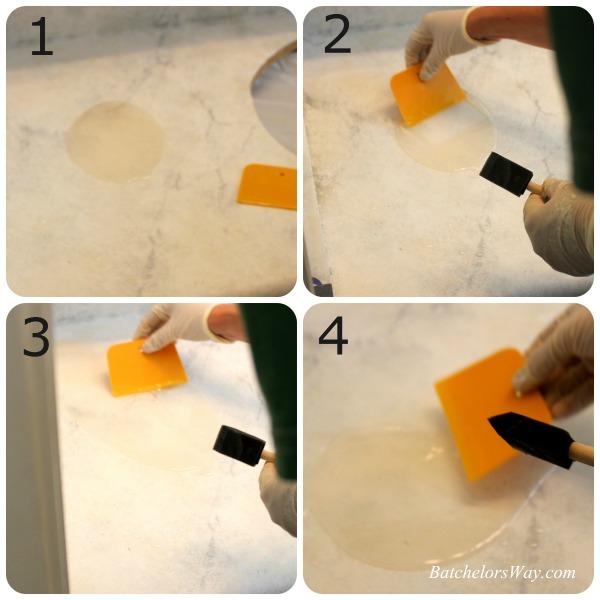 You can use the brush to spread the glaze on the vertical surfaces such as the back splash and over the edge. You need to work quickly as it will start to set up. Once it is covered you can use a blow torch to get rid of any bubbles. My blow torch died during this process. So you can also blow hard with your mouth, or use a blow dryer. Once you are happy with it you just let it dry. I did go back lots during the first hour and used the sponge brush to wipe the drips forming on the underside of the counter top edge. I went to bed and woke up to this!!! Some how I had missed all these bubbles!! I looked at it with the lights on and off the day before, but not from all angles!! The challenge of pouring glaze with installed counters is not being able to walk completely around the counter and to find imperfections!! 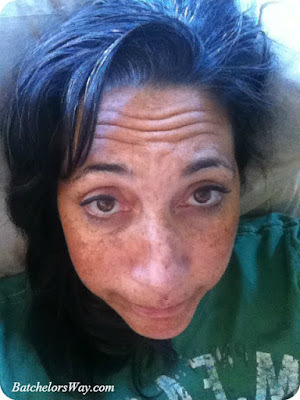 This was me fretting for two days!!! 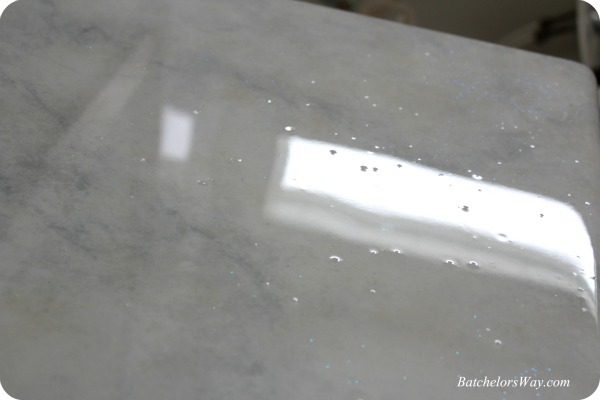 I went on line to find a cure for my bumpy bubbly counter top!! I finally decided to pour a second coat. This counter was small and I had only used half of the bottles. I started by sanding down the tops of the bubbles with fine sand paper. Holes will be filled in but bumps will still be bumps. So I sanded 'til the whole surface was smooth again and then cleaned it off and wiped it down with rubbing alcohol. Round 2 of mixing and pouring glaze!! I was very vigilant finding bubbles and checking from every angle. I all but stood on my head this time!!! I did however mess up a small section of the front edge during the pour, and tried messing with it but it was starting to set. I finally had to let it dry. It is more like a wave in the finish in that one spot. You can only see if from a certain angle when the light is not on. After freaking out about it, I decided to let it go and not worry. I have learned you can sand this surface with fine grit sand paper and have a more matte finish. I want to see how the finish holds up in the bathroom and may latter just sand the whole thing to a matte finish. Here is what the bubbly section looks like after the second pour. It was definitely harder to do this processes in place, but I am happy with the results. This counter has been in place for about three months and I haven't had any real complaints. My daughters are messy and get make up, and hair products all over this baby, but it just wipes up. We did just recently find out it can be scorched. The girls have used their curling irons and flat irons on it with no problem, until a few days ago, the flat iron was left on all day. I found two slightly yellow scorch marks. I am keeping it real so you can decide if this is for you. It's a good fit for us right now. We are low on funds and high on kids. 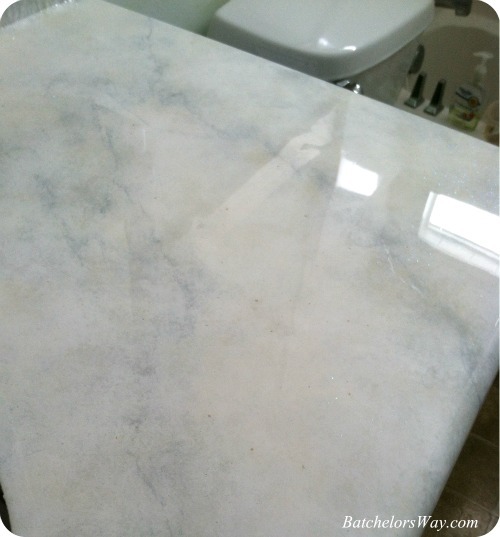 I would just cry if we had $1000 marble and she stained it. I will check back and show you how this counter holds up over the long haul! I am happy with $25 for a new counter!! Wait 'til you see it with the new cabinet color! !